Written for college level beginning and introductory IBM mainframe assembler language courses, the Assembler Language Programming for IBM Mainframes, is aimed at readers with prior programming experience on mainframes. In a step-by-step, gradient approach, the basic elements of the IBM Assembler Language are presented including both DOS and OS macros. Assembler Language cannot be studied independent of the computer architecture and operating system. However, the book always introduces just the right amount of system information to fully understand the instructions in that chapter. Thus, by the end of the book, a significant amount of systems internals have been presented. The ebook is in pdf format and is DRM-free so it can be read on any device that can display pdf files! The first half of the book presents basic Assembler Language elements. These include a structured programming shell, data definition instructions, the data movement and character comparison instructions, methods of controlling the printed output and the use of internal subroutines. Next the packed decimal mathematics instruction set is presented along with methods of editing numbers for print or display use. Then the fixed binary instructions are covered. These first fifteen chapters are often sufficient for the beginning programming course. Only the QSAM access method for I/O is used. The last half of the book covers the remaining instruction set. Basic looping instructions are covered followed by the machine instruction formats. Next, an entire chapter is devoted to the various ways of indexing can be done – that is, array processing. Handling external subroutines with the associated parameter passing is typically a difficult topic for beginners. One of the lengthiest chapters covers all the various methods that separately compiled routines can be invoked and passed parameters. There are two chapters devoted to an overview of how the operating system functions. This then leads into the use of the interval timer. The read and write macros are then presented along with the mandatory methods of blocking and deblocking records. Data compression is added so that a solid understanding of BSAM I/O access method is gained along with some possible uses of it. Then the multi-tasking macros are presented. There is an extensive chapter on the EXCP (execute channel program) method for I/O with sample coding for tape drive operations. The final two chapters show one how to write your own macros and how to write reentrant modules. Note that this is not a textbook; it does not have sample problems, review exercises or programming problems. 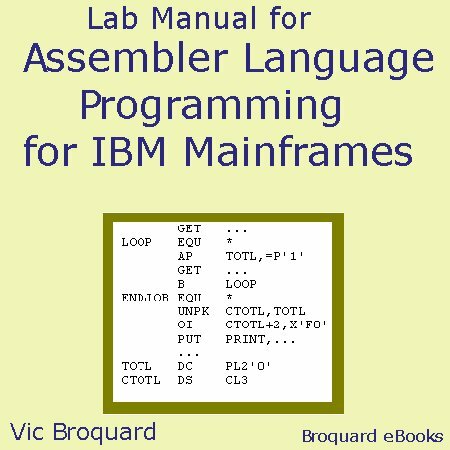 Assembler Language Programming for IBM Mainframes comes in an Adobe pdf file. If you do not have the Adobe Reader, Get Adobe Reader by clicking this link.